Config Advisor is a configuration validation and health check tool for NetApp systems. It can be deployed at both secure sites and non-secure sites for data collection and analysis. Config Advisor can be used to check a NetApp system or FlexPod for the correctness of hardware installation and conformance to NetApp recommended settings. It collects data and runs a series of commands on the hardware, then checks for cabling, configuration, availability and best practice issues. The Data ONTAP PowerShell Toolkit is a PowerShell module containing over 1300 cmdlets enabling the storage administration of NetApp controllers via ZAPI. Full cmdlet sets are available for both 7-mode and clustered Data ONTAP. The Toolkit also contains several cmdlets aimed at storage administration on the Windows host, including: creating virtual disks, resizing virtual disks, reclaiming space in virtual disks, copying files, deleting files, reclaiming space on host volumes, and much more. The plug-in runs on the ESXi host and takes advantage of enhanced storage features offered by VMware vSphere. On the NetApp storage system, the NFS vStorage feature must be enabled for the ESXi host to take advantage of VMware VAAI. For details about enabling VMware vStorage over NFS, see the Data ONTAP 8.1 File Access and Protocols Management Guide For 7-Mode and the Clustered Data ONTAP File Access and Protocols Management Guide. The plug-in performs NFS-like remote procedure calls (RPCs) to the server, using the same credentials as that of an ESXi NFS client. This means that the plug-in requires no additional credentials and has the same access rights as the ESXi NFS client. NetApp FAS/V-Series Storage Replication Adapter for Data ONTAP operating in 7-Mode is a storage vendor specific plug-in to VMware vCenter Site Recovery Manager that enables interaction between Site Recovery Manager and the storage controller. The adapter interacts with the storage controller on behalf of Site Recovery Manager to discover storage arrays and their associated datastores and RDM devices, which are connected to vSphere. The adapter manages failover and test-failover of the virtual machines associated with these storage objects. The Config Validator tool can be used to validate the Linux host settings in NetApp SAN environment and change/configure them if necessary. The tool validates the settings related to the storage stack such as DM-multipath, iSCSI settings, HBA parameters, etc. on hosts connected to NetApp storage controllers running 7-Mode Data ONTAP or Clustered Data ONTAP. Unfortunately its RedHat only at this time. System Manager is a graphical management interface that enables you to manage storage systems and storage objects (such as disks, volumes, and aggregates) from a web browser. This post demonstrates how to enable bidirectional or mutual CHAP on iSCSI luns between Oracle Enterprise Linux 6 update 5 and NetApp storage. The aggregate, lun and disk sizes are small in this HOWTO to keep it simple. 1) Install open-iscsi on your server. 2) Display your server’s new iscsi initiator or iqn nodename. 3) On the NetApp filer, create the volume that will hold the iscsi luns. This command assumes you have aggregate aggr1 already created. If not, use an aggregate that has enough room for your volume. 4) Create the lun in the volume. 5) Create an igroup and add the Oracle Enterprise Linux iscsi nodename or iqn from step 2 above to it. 6) Map the lun to the igroup and give it lun ID 01. 7) Obtain the NetApp target nodename. 8) Set the CHAP secret on the NetApp controller. 9) On the server, edit your /etc/iscsi/iscsi.conf file and set the parameters below. 10) On the server, restart the service and discover your iSCSI target (your storage system). 11) On the server, manually login to the iSCSI target (your storage array). Note there are two dashes “- -” in front of –login. It always looks like one. Login to [iface: default, target: iqn.1992-08.com.netapp:sn.84167939, portal: 10.10.10.11,3260] successful. 12) Stop and start the iscsi service on the server. Pause for 10 seconds and then run the next command. 13) From the server, check your session. 14) From the server, check the NetApp iSCSI details. Note there are two dashes “- -” in front of mode, targetname and portal. Sometimes it looks like one. 15) From the server, find and format the new lun (new disk). On the fdisk command wizard, enter the letters in bold below. Building a new DOS disklabel with disk identifier 0x54ac8aa4. After that, of course, the previous content won’t be recoverable. 16) On the server, create the Linux file system on the new partition. 18) Create the mount point and manually mount the directory. 19) Add the new mount point to /etc/fstab. Note: the _netdev option is important so that it doesn’t try mounting the target before the network is available. 20) Test that it survives a reboot by rebooting the server. With the _netdev set, iscsi starts and your CHAP logins should take place before it attempts to mount. After the reboot, login and verify its mounted. When done rebooting, login and verify the lun is mounted. 21) On the server you can check session stats. 22) As root, change permissions on /etc/iscsi/iscsid.conf. I’m not sure why they haven’t fixed this clear text CHAP password in a file issue so just make sure only root can read/write the file. 23) On the NetApp storage you can verify the Lun and the server’s session. This is a companion post to sniffing packets in ESXi I posted here. Say you need to isolate traffic to troubleshoot iSCSI CHAP session negotiation failures between ESXi and NetApp storage. 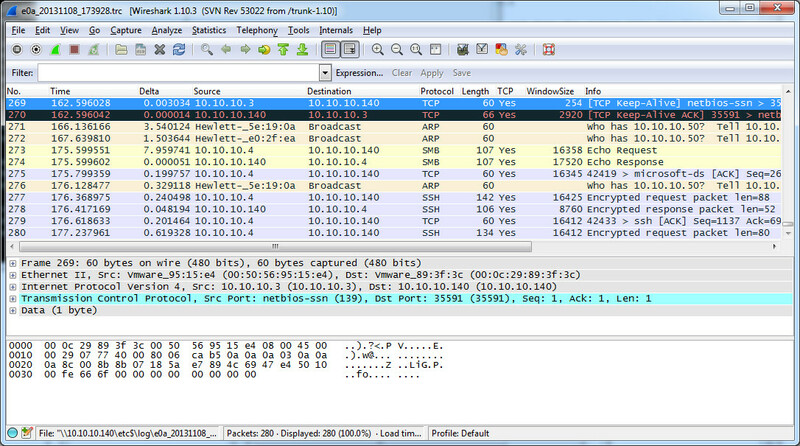 1) Dump the traffic to a pcap file and open it with Wireshark. Before you start the capture, change directories so you can easily recover the pcap file from the datastore in vCenter. a) When done, in vCenter select the ESXi host you were sniffing packets on, then click the Configuration tab > Storage. b) Right-click datastore1 (or the datastore were your pcap file is) and select Browse datastore. c) Click download a file > select the location and click OK.
d) Double-click the file and it will open in Wireshark. e) In Wireshark, in the upper left, enter iscsi.login.T in the Filter: field and click Apply. This only shows the iSCSI login packets. You can clearly see on the right in the Info column, packet 856 is an Authentication Failure packet. Another way to see the authentication failure is with Splunk. Assuming your NetApp storage (or any vendor) is configured to send syslog to Splunk, you can easily find the event. Splunk is an excellent Syslog server. You can download and use it for free up to 500 Megs a day indexed. I won’t go into the Splunk configuration in this post. I’ll post that soon. 1) Login to the Splunk UI, click Search to launch the Search app, enter the string below and the results will be displayed. – Note: replace the IP address with your storage controller hostname or IP. The plug-in installs on the VMware ESXi v5x host. It takes advantage of vSphere’s enhanced storage features. On the NetApp controller, the nfs.vstorage.enable option has to be set to “on” so the ESXi host can take advantage of VMware VAAI. This plug-in performs NFS-like RPCs to the server, using the same credentials as that of an ESXi NFS client. That means the plug-in needs no other permissions and has the same access rights as the ESXi NFS client. This is supported with DOT 8.1.1 and later. Copy Offload – A process that used to take a few minutes now runs in seconds. This reduces traffic on the ESXi host and lowers CPU utilization for that task. Space Reservation – This allows you to create thick virtual disks on NFS datastores. Through the VAAI Reserve Space primitive, you reserve space for the file when its created. 1) Configure the NetApp Controller (this is for 7-Mode). 2) In vCenter, select an ESXi host. Select the Configuration tab and then Storage under Hardware. a) Under Datastores, right-click datastore1 (or whatever your local datastore is named) and select Browse datastore. b) Click the Upload icon and select Upload a file. Browse to the NetAppNasPlugin.v20.zip file and click Open > Yes. 3) Enable SSH on the ESXi host or use the console CLI. a) In vCenter, select the host > Configuration tab > Security Profile > across from Services, click Properties. b) Scroll down to SSH and click Options. Click Start > OK > OK.
5) Install the Plugin on the ESXi host. 6) Reboot the ESXi host. Either through vCenter or at the command line. 7) Verify the plugin is installed on the ESXi host. You will have to re-enable SSH in vCenter. 8) Create an NFS export on the NetApp Controller and mount it as a new NFS datastore on the ESXi host. These steps below are specific to my configuration but you should be able to figure out your variables. 9) Verify that the new datastore is VAAI supported with the following command. Look for NAS VAAI Supported: YES at the bottom of the output. NFS-1.00 file system spanning 1 partitions. 10) You can also verify VAAI support with the following commands. HOWTO use Wireshark to read a packet capture from NetApp Data ONTAP after running the pktt command. 1) Identify the controller’s NIC where you want to sniff packets on. In this case we will use e0a. 2) Using the pktt command, start the capture on interface e0a and dump the output into /etc/log on the controller. When you run the command, a file is created in /etc/log/ with the NIC name (e0a), a date/time stamp and a .trc file extension. 3) You can check the status of the packet capture and get details. e0a: Packet tracing enabled; packets truncated at 1514 bytes. lo: Packet tracing enabled; packets truncated at 1514 bytes. losk: Packet tracing enabled; packets truncated at 1514 bytes. 4) After a period of time you deem adequate, stop the packet capture. e0a: Tracing stopped and packet trace buffers released. Fri Nov 8 17:42:25 EST [sim81:cmds.pktt.write.info:info]: pktt: 280 packets seen, 0 dropped, 32046 bytes written to /etc/log/e0a_20131108_173928.trc. 5) Verify that it has stopped. 7) Browse to the log folder and locate the .trc file you just created. 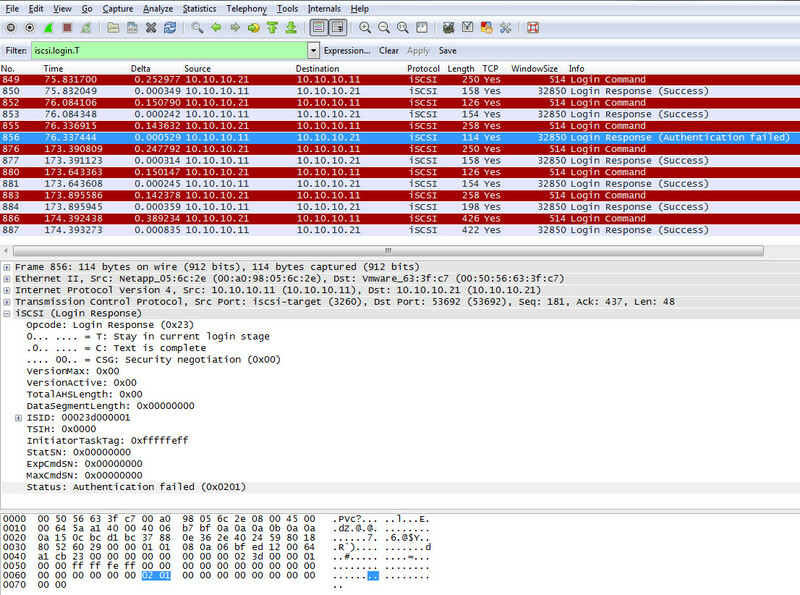 Double-click the file and it will load in Wireshark. 8) You can now operate on the trace file and filter, search and analyze packets. NetApp releases new versions of 7-Mode Transition Tool, SnapManager, NFS VAAI Plugin, VSC, and two new Oracle tools. The 7-Mode Transition Tool enables copy-based transitions of Data ONTAP 7G and 7-Mode FlexVol volumes and configurations to new hardware that is running clustered Data ONTAP 8.2, with minimum client disruption and retention of storage efficiency options. Attention: You can transition only network-attached storage (NAS) environments to clustered Data ONTAP 8.2 using the 7-Mode Transition Tool. SnapManager for Microsoft SharePoint is an enterprise-strength backup, recovery, and data management solution for Microsoft SharePoint 2013, 2010 and 2007. The Virtual Storage Console for VMware vSphere software is a vSphere client plug-in that provides end-to-end virtual machine lifecycle management for VMware virtual server and desktop environments running on NetApp storage. The NetApp Storage System Plug-in for Oracle Enterprise Manager delivers comprehensive availability and performance information for NetApp storage systems. By combining NetApp storage system monitoring with comprehensive management of Oracle systems, Cloud Control significantly reduces the cost and complexity of managing applications that rely on NetApp storage and Oracle technologies. NetApp and Oracle have collaborated to provide the ability to quickly clone a PDB database from the Oracle Database 12c SQL command line. This integration leverages NetApp FlexClone technology which allows you to develop and test applications faster by creating instant, space efficient clones of PDBs that shorten the design cycles and improve service levels. This post demonstrates how to enable two-way or mutual CHAP on iSCSI luns between Debian Linux 7.1 and NetApp storage. The aggregate, lun and disk sizes are small in this HOWTO to keep it simple. 3) On the NetApp filer, create the volume that will hold the iscsi luns. This command assumes you have aggregrate aggr1 already created. If not use an aggregate that has enough room for your volume. 5) Create an igroup and add the Linux iscsi nodename or iqn from step 2 above to it. 6) Map the lun to the iscsi-group and give it lun ID 01. 10) On the server, discover your iSCSI target (your storage system). 11) On the server, manually login to the iSCSI target (your storage array). [ ok ] Starting iSCSI initiator service: iscsid. [ ok ] Mounting network filesystems:. 13) From the server , check your session. 14) From the server, check the NetApp iSCSI details. 15) From the server, find and format the new lun (new disk). Building a new DOS disklabel with disk identifier 0x07f6c360. Display the iSCSI Initiator Node Name or IQN from the command line. At some point you will be asked by a Storage Engineer for your system’s iSCSI Initiator Node Name or your iqn. This list shows you how to get your local iSCSI initiator name or iqn from the command line. This assumes the iSCSI service is installed, enabled and running. If you have a different way or want to add an OS or platform to this list simply leave a comment and I’ll add it. These are major new versions with much needed support for cDOT 8.2, Powershell and SMB 3. 1) Support for clustered Data ONTAP 8.2. 2) Support for databases running on clustered Data ONTAP SMB 3.0 shares. 3) Support for archiving backups to SnapVault secondary volumes running on clustered Data ONTAP. 5) The option to restore databases to a different location on the same Microsoft SQL Server instance. 6) Performance improvements when restoring databases from a LUN that stores multiple databases. 7) The Backup report now includes the cmdlet syntax for database backups initiated from the Backup wizard or Backup and Verify option. 8) Support for running SnapManager from a group Managed Service Account. Read these URLs to see why you should be interested in SMB 3.0. This is a relatively unknown plugin for DFM/Operations Manager, now called OnCommand Unified Manager. The Plugin helps to answer a number of questions related to storage utilization and storage efficiency savings. It also helps in identifying ways to improve the storage utilization. It is implemented as a script that can be installed on the Operations Manager server. The script can be scheduled for execution in Operations Manager and generates a set of web pages that provide an Efficiency Dashboard for the NetApp storage systems managed by Operations Manager. Two primary charts are produced with additional charts to provide detailed breakdowns of how the storage space is being consumed. These charts can be produced to represent all storage systems being monitored by Operations Manager, ‘groups’ of storage systems as grouped in Operations Manager or a single storage system. I wonder why they don’t include this as a tab inside OnCommand Unified Manager by default. Note: click images to see a larger version. a) Login to Operations Manager as an administrator. Click Management > Scripts. b) On the Scripts page choose the option to select the omeff_oc52_windows64.zip file you downloaded above and click Add Script. c) On the Confirm page, read the summary and click Add. d) After the script is installed, in the lower section, select the script check box and click “No” under the Schedule column. e) On the add a schedule page, enter a name for the plugin such as Storage Efficiency Plugin and at the bottom, enter the schedule of your choice. I run it daily at 05:00 AM. Click Add Schedule when done and you should see the schedule you chose. 3) Access the Dashboard. After the script has run the first time, the dashboard will be available. Its located at the root on your OnCommand URL. Just add /dashboard.html at the end as shown in the example below.